Four years ago when President Obama ran for reelection against Mitt Romney, the youth vote was decisive. Some studies showed that Obama's millennial lead of 37 points may have won him the swing states of Florida, Virginia, Pennsylvania, and Ohio. Fast forward four years and the headlines have implied that millennials aren't voting for Hillary Clinton and rather that their Bernie write-ins might cost her the election. Forget all that. If you need motivation to get you to the polls, this is it: take a look at the Electoral College map of millennial voters and then get over to your polling place. That's because it will hammer home the difference that your vote will make. The current maps on FiveThirtyEight show Clinton coming out on top of this mess of an election, but not with an overwhelming margin. It's a different story among millennial voters. Survey Monkey released an interactive map last month that allows you to see how certain demographics are voting, and it was updated with the latest data on Election Day. Here's the good news: if only 18- to 34-year-olds were voting, it would be a Clinton landslide. Just five states would vote Republican and she would likely top out her Electoral College share around 500. Sounds like utopia, and yet some millennials won't be voting today. That's a mistake and this map shows you why — especially if you compare it with the map for elderly voters. (They would hand the election to Trump!) Now, for the first time ever in this election, millennials match baby boomers as a share of eligible voters. So the question is whether you will make yourself heard at the same rate that they do. Traditionally, younger voters have participated at the lowest rates in elections. But that can change. Make your plan to vote today. Bring a friend. Spread the word. 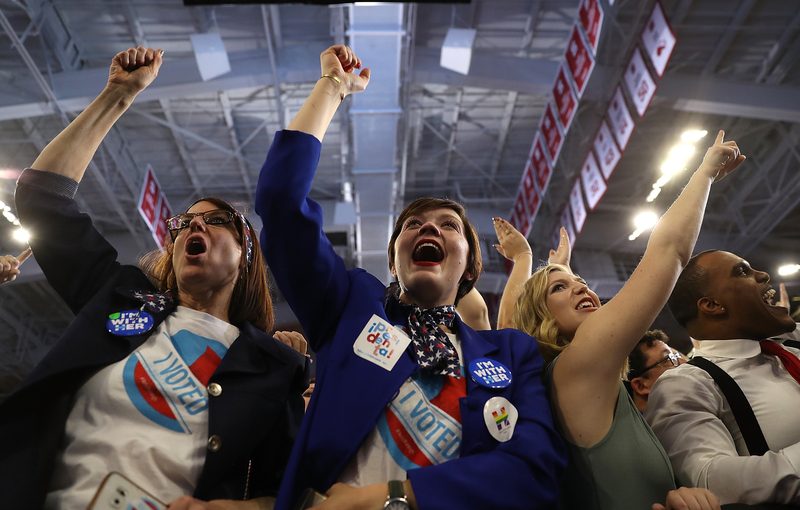 If millennials alone had the vote, not only would Clinton win, but it would also drive home the point that sexist, misogynistic, racist, xenophobic, Islamophobic, ableist rhetoric repels the average American. Or at least the average American under 35. And the political parties (*cough, cough* the GOP) need to figure that out now. So vote today and hammer home that message. Millennials are voting for a tolerant United States that embraces its diversity. If you need motivation to drown out the voices that disagree — and make extra sure that Clinton wins — just take a look at this map.